Concerned Vancouver and Burnaby, B.C. 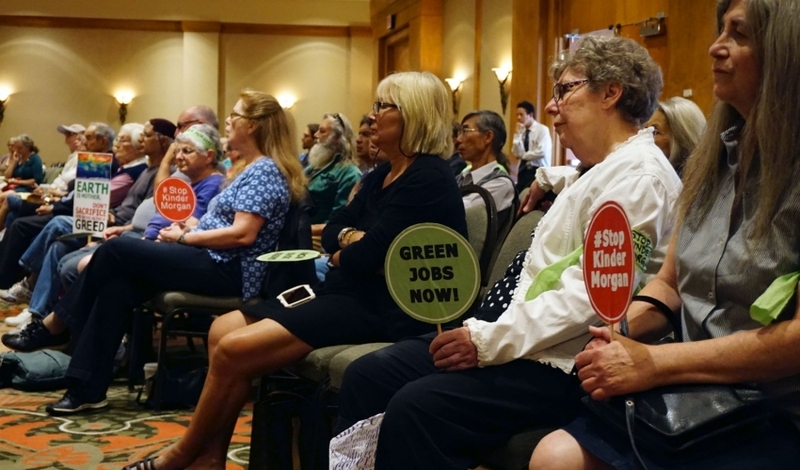 residents present their opposition to the Kinder Morgan Trans Mountain expansion before a federally-appointed panel on Wed. Aug. 10, 2016, in Burnaby, B.C. Photo by Elizabeth McSheffrey. There’s nothing more disrespectful than pretending to listen. That’s exactly what the federal government did this summer when they sent their hand-picked panel to listen to communities along Kinder Morgan’s proposed tar sands pipeline route. Everyone — from the opposition to the media to the panel itself — knew the government was hell-bent on getting its pipeline built. I attended nearly all of these town hall meetings, from Kamloops to Vancouver. Despite being held with no notice, on weekdays in the middle of summer, more than 1,700 people came to speak. Over 90 per cent opposed the pipeline. A report from the panel released Thursday raised many of their concerns. 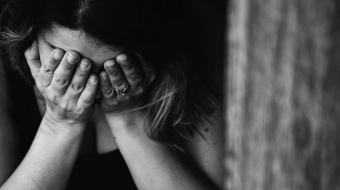 However, the report failed to acknowledge the overwhelming lack of consent in British Columbia. While the panel has posed six daunting questions to the federal government, it was very clear from the outset that their purpose was not to change minds in Ottawa but to satiate a furious opposition. Cataloguing the public outcry so the federal government can claim it has heard everyone’s voices will not change the steadfast rejection of this project by the communities along its route. The heartfelt testimony and damning evidence in the report is impossible to ignore. People can see through Trudeau’s sunny ways and if he approves Kinder Morgan, the storm is on its way. How did it get this bad? It all started when former Prime Minister Stephen Harper removed pipeline reviews from the Canadian Environmental Assessment Agency and handed it to the industry-dominated National Energy Board. This government “regulator” looked more like a Calgary oil company boardroom, even requiring its members to reside in the tar sands capital. In the 2015 federal election, candidate Trudeau promised to overhaul the NEB and restart the review for the Kinder Morgan pipeline project. After the election, Prime Minister Trudeau apparently forgot his campaign promise. 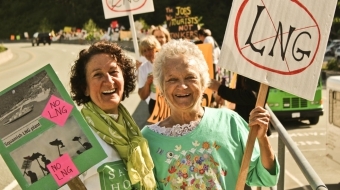 In January, the NEB hearings continued despite growing protests. 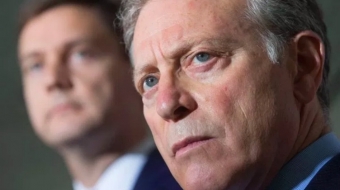 Having boxed himself into a corner by decrying the rigged NEB process then proceeding anyway, his federal cabinet announced it would tack on a two-month additional consultation to report back to the government with concerns from communities along the pipeline and tanker route. But news reports suggest the government made its decision before even seeing the panel’s report. Anybody who has been paying attention to cabinet rhetoric about getting tar sands to market “sustainably” knows this to be the case. People feel betrayed. B.C. communities have said no to this pipeline over and over again. Even though we all knew the panel was a joke, even though we didn’t want to dignify such a profoundly, obviously, flawed process, we showed up. Everyday citizens took the time out of their summer schedule to show that they care. Families, students and Indigenous elders made a passionate plea for the coast, the climate and human rights. Tears were shed. Hugs were shared. A young couple in Burnaby told the panel about an emergency plan to put their housecat in a backpack and hike down the side of Burnaby Mountain in case they need to escape a disastrous tank farm fire. A young chief spoke in Kamloops about how the pipeline would lead to sickness and suicide in Indigenous communities. These meetings were heart-wrenching. Now that this report is out Prime Minister Trudeau has only one option. He must respect the choice of the communities at risk and reject the Kinder Morgan pipeline. If this whole panel process turns out to be a sham, and the grave concerns of British Columbians are ignored, the government does so at its peril. Here on the West Coast we don’t appreciate being ignored. In the 1991 provincial election, British Columbians booted the Social Credit Party from office and elected a new NDP government with the promise of change. Yet, when putting together its land use plan for Clayoquot Sound, the Province used the previous government’s faulty information. In 1993, they called for logging two-thirds of the region’s old-growth forest. What followed was the largest act of civil disobedience in Canadian history. Does this all sound eerily familiar? Justin Trudeau's failure to live up to his promises is taking us all to a place that could make the Clayoquot protests look like a walk in the park. This pipeline is an assault on a proud West Coast cultural identity. Driving southern resident killer whales to extinction is a non-starter here, as is dramatically increasing the risk of a spill, all without Indigenous consent. Meanwhile our region’s efforts to fight climate change would be tarred with a pipeline that enables the expansion of one of the most polluting projects on Earth. On November 19th, we will join together at noon at Vancouver City Hall to show the rest of Canada that this region is ready to stop Kinder Morgan. When we say “this pipeline will not be built,” we mean it.